The scientific name is “bison”, but “buffalo” has commonly been used for many years in North America. However, product that is labeled as buffalo is commonly water buffalo, an entirely different species of animal. Meat from water buffalo is typically imported from outside North America. Great Range Bison is 100% North American Bison. No, not only are they not endangered, they have never been on the endangered species list. 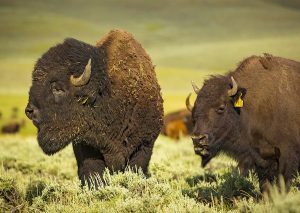 In the late 1800’s there were estimated to have been less than 1,000 Bison remaining in the world. Today, there are over 400,000 in North America and the number is growing. As more consumers make bison a part of their regular diet more bison will be a part of the North American landscape. What has Led to the Return of the Bison? Private ranchers are the reason. 90% of bison on the North American landscape are owned by private ranchers. All bison are pasture-raised. The free-range breeding herds (cows and bulls) spend their entire lives on pasture. Young bison are fed some grain prior to harvest for approximately 100 to 150 days so that we can produce a premier, high quality, fresh product year round. In order to be both environmentally and economically sustainable there are trade-offs. By feeding some grain to the young bison our products are consistently high quality, tender and flavorful year round.